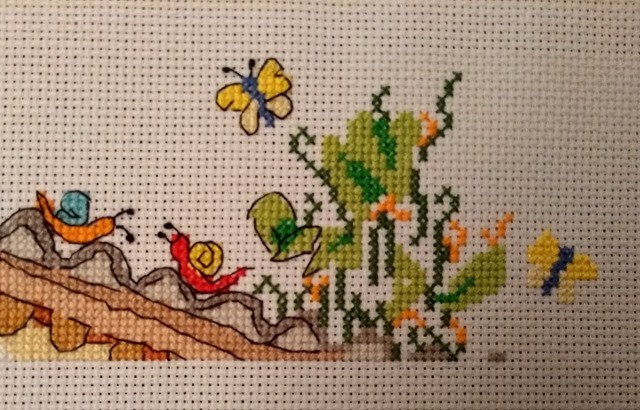 The butterfly without the backstitch was in the wrong place so it moved between the 2nd and 3rd photo LOL. Lovely work Avis. It’s a shame the poor butterfly had to be reworked but I guess it was only a small mistake! It was, and I found it as soon as I’d finished it. No harm done. The butterfly needed to fly higher! Glad it got its wings! Yes, much better where it is. I remember feeling like I’d really made progress that day and then it dawned on me aargh! I haven’t seen this project yet but it looks challenging and sweet at the same time. Great progress. I couldnt see the mistake. I needed to change the position of the butterfly between the 2nd and 3rd photos. These are so much easier to stitch than they look. It’s looking great. Shame your butterfly didn’t fly high enough the first time, but as least you spotted it quickly. I did, and it had to be moved because it was in the way of the brown splodge which will eventually become another bird. He’s learning to fly, now he’s fluttered a bit higher! Lovely project, makes me smile! There’s lots of fun in all of the Cut Thru designs. I love to see them on my wall. Took me a bit, but I found him! Very satisfying to have made it across I’m sure. I ❤️ the way this comes alive with the Backstitching. It was only a few stitches to redo but it always happens when you think you’re doing so well hehe. Haha! Sounds tasty 🙂 The next sections are all more stitch intensive. Maybe I should’ve started at the bottom. I also could not find the mistake. It looks so pretty to me! I couldn’t see the mistake…had to read the comments and then scroll back up to see the butterfly moved, lol! Looking great! Well done 🙂 It’s a lot of fun to stitch but I need to put my skates on this time as the next section has a lot more stitching. Your butterfly just needed to fly a little higher, that’s all. 🙂 And I love the “before” and “after” photos that show just how much backstitching does for a design! It did, especially if it wasn’t going to be overstitched by the bird hehe! Thank you for adding me to the SAL. 🙂 Congratulations on finishing the rooftop! I love seeing your progress on this piece. I needed the comments of others to find your mistake! 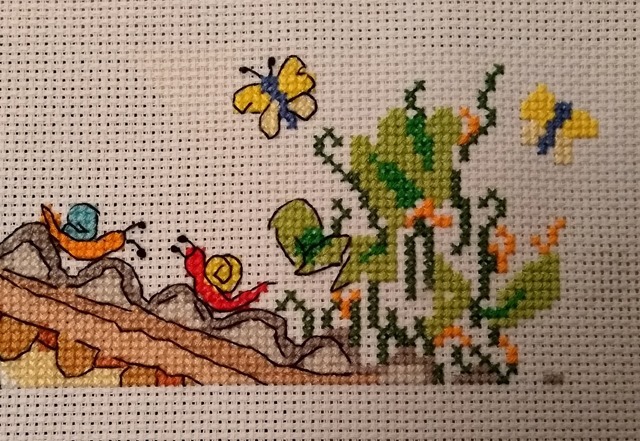 Love the way that the backstitch brings everything to life! I notice the butterfly has flown a bit higher! 🙂 Your embroidery is looking so great!!! Congrats on finishing the section!